Kent Frozen Foods pride themselves on providing high quality, locally-sourced food products and catering supplies to their customers, and their ongoing success has led to them investing in an expansion project and building a new cold storage chamber that gives them the capacity to serve their existing customers more effectively and grow their business further. This development project has brought together two leaders in their own fields – Cool Advice Services, the Sittingbourne-based cold store specialists, and Sheffield’s Constellation Lighting, who have been subcontracted to supply and install the lighting for the new facility. 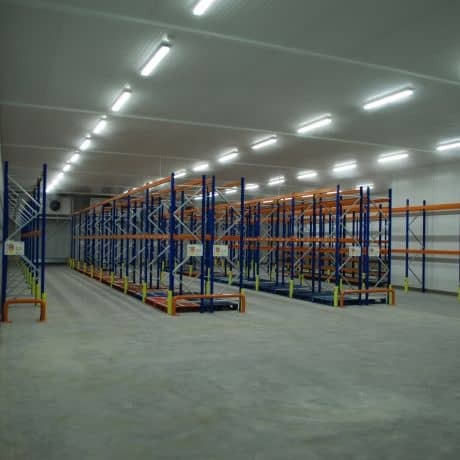 During the project scoping process, the installation of LED lighting stood out as the obvious choice for the new cold store, with numerous advantages over the alternatives. The cold store will operate at -21ºC, and the temperature needs to be kept constant to ensure the integrity of the produce stored. Any fluctuations in temperature can lead to the food spoiling and becoming unsaleable. LED lights generate very little heat when operating, with any residual heat being dissipated through heat sinks. Because there is little impact on the temperature within the cold store, the refrigeration system is able to run at a constant level, without the need for excess energy to combat fluctuating temperatures. Indeed, LED lights run more efficiently at lower temperatures, and have a longer life expectancy as a result – in the region of 100,000 hours. That’s over 11 years of constant use, without the need for any maintenance. This bespoke lighting system incorporates occupancy sensors so that the lights come on when there is someone in the cold store, and switch off when there isn’t, thereby minimising energy consumption. On top of this, each LED fitting consumes only 60W of energy, and the entire site consumption adds up to 3kW. Compare this to a consumption of 8kW were fluorescent lights to have been used, and you see yet another energy saving. All industrial fittings comply with protection class IP65, and as such are protected from the ingress of dust and water. Therefore, it is possible to wipe or even hose down the lighting units to clean them without risk of damage. Lights reach 100% brightness within 100ms of switch on – practically instantaneous. ‘White’ light is easier to work in, better for reading labels and more comfortable for the workforce, thereby increasing productivity.